To understand Beto O’Rourke as a candidate, it’s vital to go beneath the surface of his political backstory. News watchers are already well aware of the former Texas congressman’s good looks, charisma, youthful energy and fundraising prowess. But most remain unaware of an inconvenient truth that could undermine the O’Rourke campaign among the people who matter most — the ones who’ll be voting to choose the Democratic presidential nominee next year. O’Rourke is hardly eager for those upcoming voters to realize that the growth of his political career is rooted in an alliance with powerful Republicans that began 15 years ago. Or that he supported raising the minimum age for Social Security in 2012. Or that — during six years in Congress, through the end of 2018 — he often aligned himself with Republican positions. Naturally, O’Rourke would much rather talk in upbeat generalities than answer pointed questions about why anti-Republican voters should cast ballots for him — when he has a long record of going along with many GOP positions they find abhorrent. It may be better for him if unflattering coverage fixates instead on matters like youthful stints as a punk rocker and early computer hacker. It was just seven years ago when — during his first run for Congress — O’Rourke did a campaign video to tell people in the blue West Texas district that “we’ll have to look at future generations . . . retiring at a later age, paying a greater percentage of their income into Social Security and making other necessary adjustments.” And, the Wall Street Journal reports, “in a candidate questionnaire published two days before the May 2012 primary, Mr. O’Rourke called for raising the Social Security eligibility age and means-testing federal entitlements.” According to exit polling, O’Rourke won that election with major help from Republicans who opted to vote in the Democratic primary and cast their ballots for him by a ratio of more than 7 to 1. After becoming a congressman, O’Rourke backtracked and, as Politico reports, “co-sponsored legislation that would increase Social Security benefits — without raising the retirement age.” Yet his wobbly stance on Social Security in this decade is a warning flag. O’Rourke affinity with Republican sensibilities related to corporate power has continued. So has largesse from interests that are the antithesis of progressive values. Notably, for his final term, Beto retired from the House as the member of Congress who was the second-highest recipient of campaign cash from the oil and gas industry. In June 2015, O’Rourke was one of only 28 Democrats — out of 188 members of the party in the House — who voted to give President Obama the power to negotiate the corporate-oriented Trans-Pacific Partnership. The measure squeaked through the House, propelled by support from 190 Republicans. From O’Rourke, that kind of talk has sometimes overlapped with disinterest in defeating Republicans. Last year, while running for the Senate, O’Rourke helped a friend in need — Texas GOP Congressman Will Hurd — by notably refusing to endorse his Democratic opponent. Gina Ortiz Jones, a gay Filipina-American, had momentum in a district with a majority of Hispanics. But O’Rourke’s solidarity with his Republican colleague may well have saved Hurd’s seat. It’s understandable that many progressives came out of 2018 with a favorable view of O’Rourke. He ran a strong campaign that got remarkably close to unseating the odious Sen. Ted Cruz. Along the way, O’Rourke showed himself to be eloquent and tireless. Some of his stances are both enlightened and longstanding, as with his advocacy for legalizing marijuana. And O’Rourke provided some stunning moments of oratory, as in a viral video that showed his response to a question about NFL players kneeling in protest during the national anthem; his support for dissent in the context of civil rights history was exemplary. Yet, overall, there’s a good reason why O’Rourke declines to call himself “progressive.” He isn’t. His alliances and sensibilities, when you strip away some cultural affinities and limited social-justice positions, are bedrock corporate. 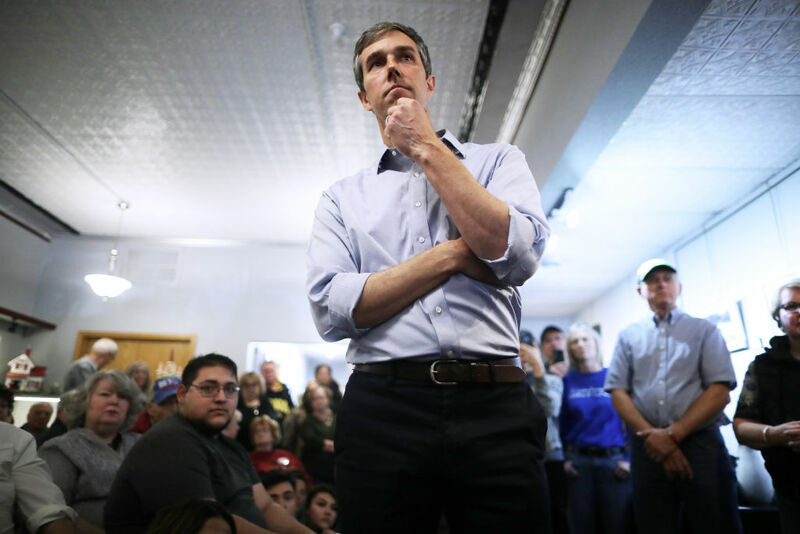 In his quest for a Democratic nomination that will require support from a primary electorate that leans progressive, Beto O’Rourke will be running to elude his actual record. If it catches up with him, he’s going to lose.